Having decided on squares (rectangles) as the design for visual impact, I begin with painting a sketch in watercolor onto a suitable support. In this instance, I have taken a sized archival matboard and mounted it directly onto a smooth, clean piece of plywood cut to leave a finished 2″ border around the edge. 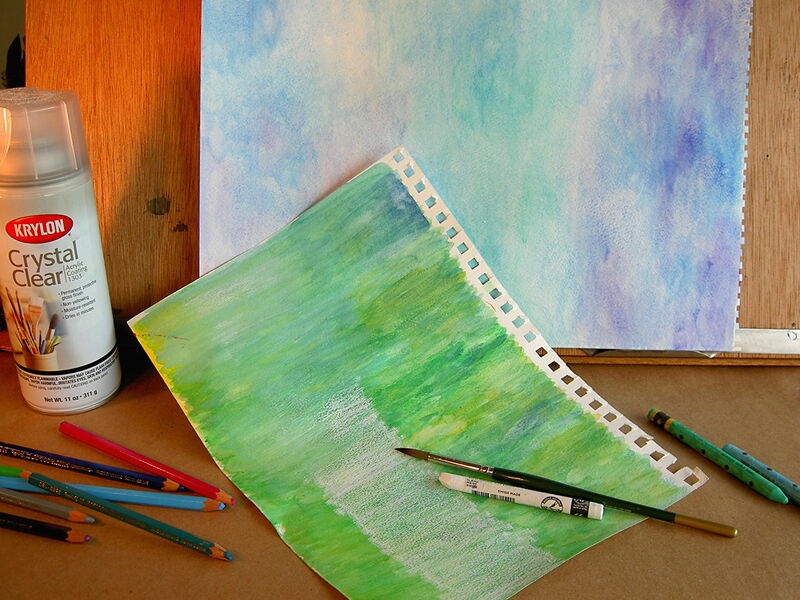 Papers ranging from 65lb to 300lb, are painted with water-based mediums. 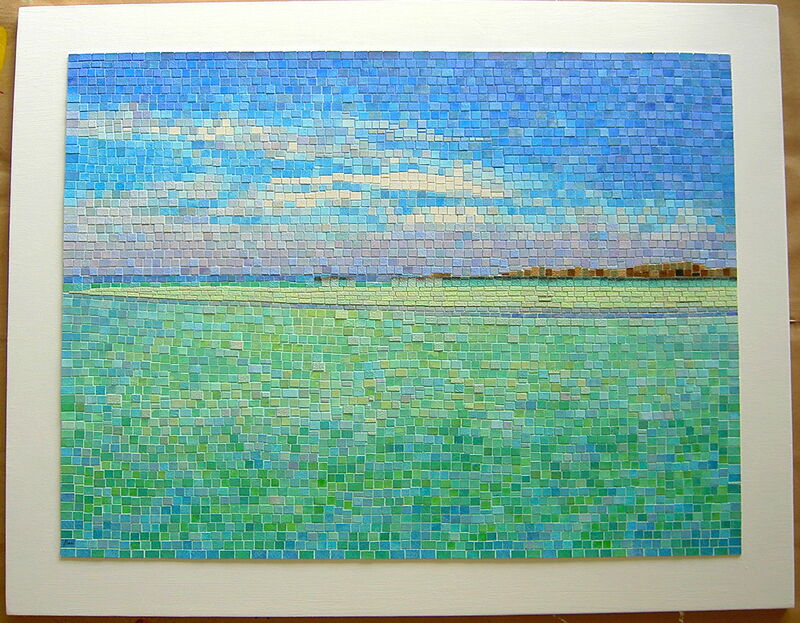 My idea is to simulate a mosaic and mimic a stained glass look. Watercolors are layered with water-soluble colored pencils and crayons; after drying thoroughly, some areas receive additional layers of iridescent, interference or liquid acrylics which give a strong sheen to the surface of the papers and change their tint in different lighting. 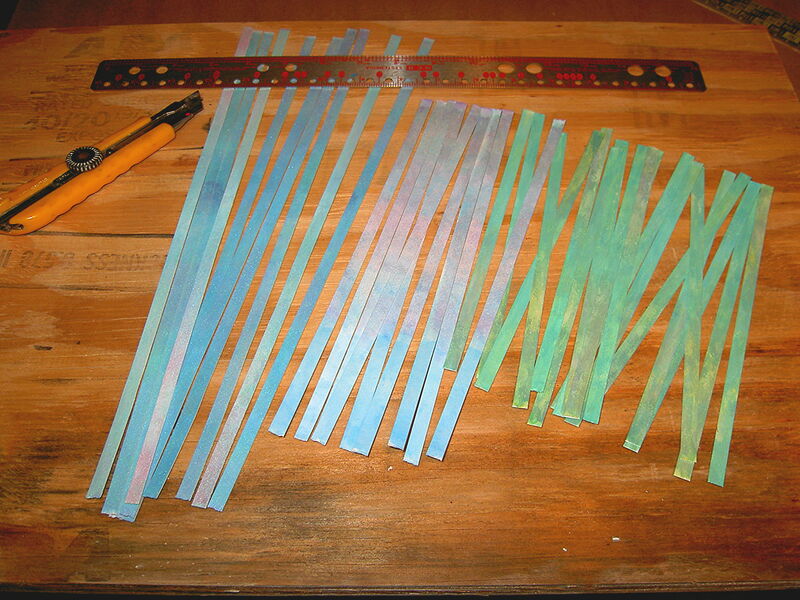 When dried again, strips are cut to desired size and squares and rectangles are produced en masse! 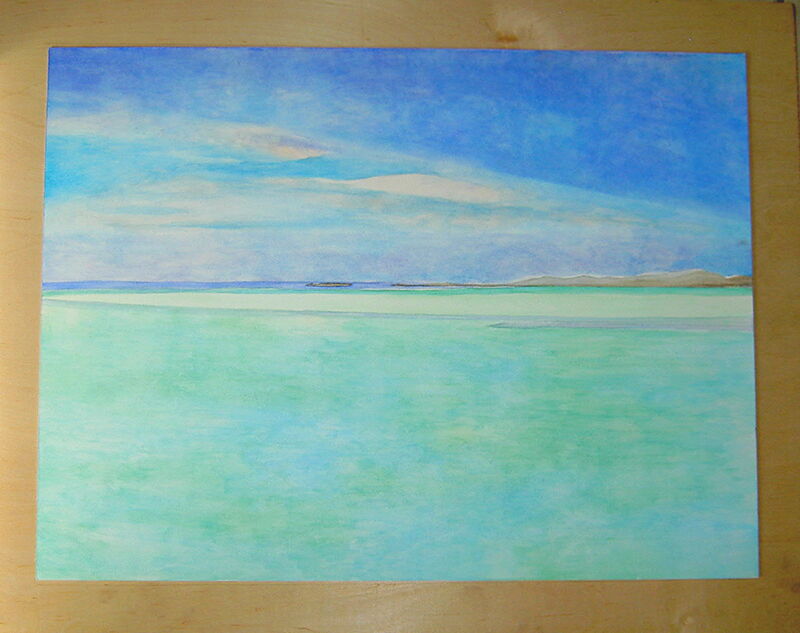 For this piece, my squares were cut to 1/4″. 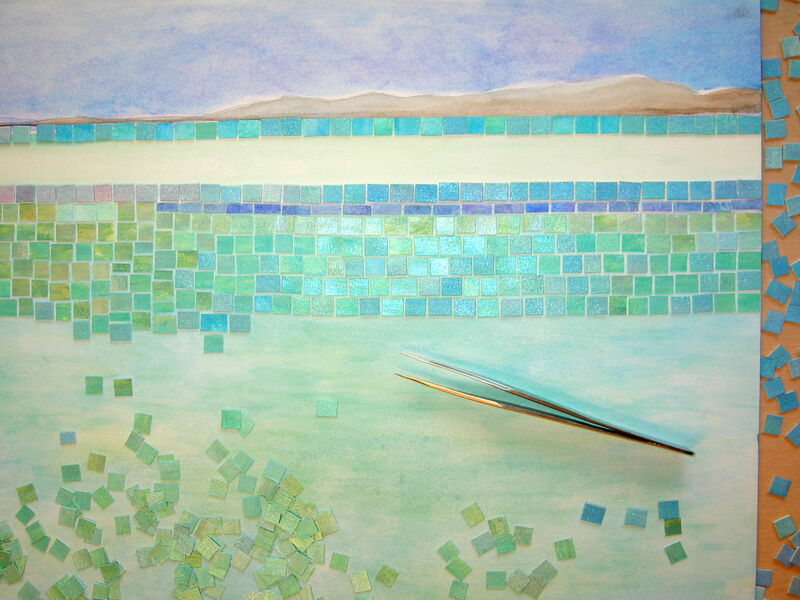 Using the sketch for guidance, the mosaic “tiles” are arranged to follow the general colors within the composition and balance visually amongst them. 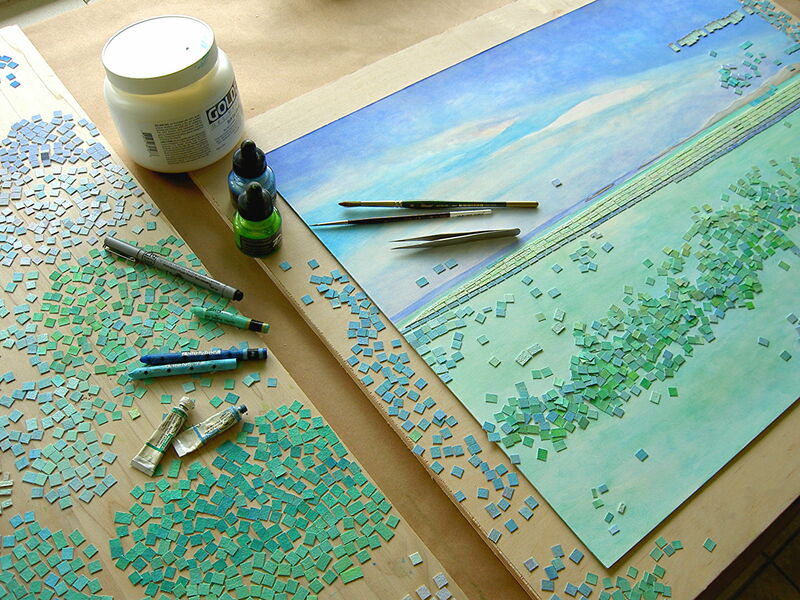 Once a small group has been satisfactorily placed, gluing with an acrylic gloss medium sets the “tiles” in place. The work is very similar to piecing a puzzle together, resulting in an intriguing visual effect! 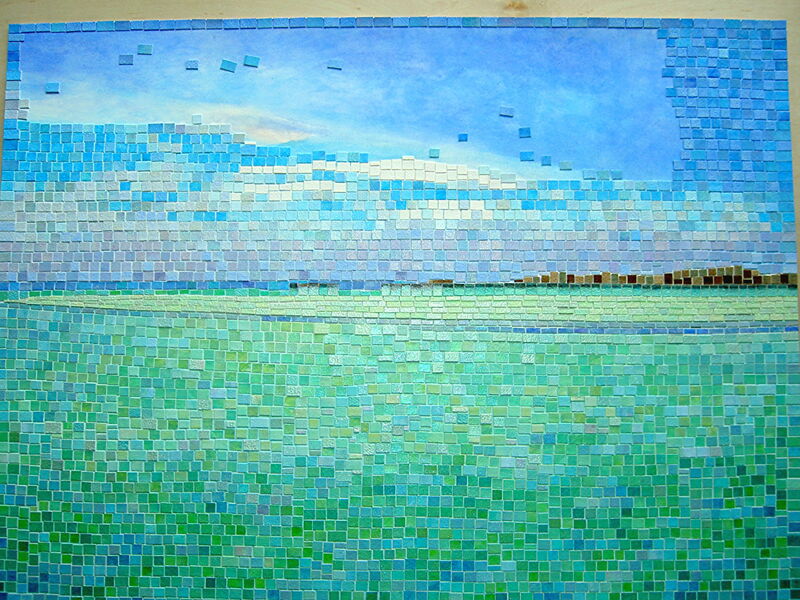 With all the mosaic pieces secured in place, I applied an isolation coat (http://www.goldenpaints.com/technicaldata/isolationcoat.php) to seal the painted squares for subsequent varnishing. The wood panel itself is sanded with 150 grit sandpaper to remove any adhesive from its surface and to smooth rough edges from slivers, followed by a finer 220 grit for preparation of a light gesso coating. A total of three coats of gesso are applied with sanding between each layer to reduce the appearance of brushstrokes and to keep the wood sealed and ready for the addition of color, or frame!